It's hard to believe but Christmas is just around the corner (as is my birthday--YAY!). So, I thought I'd share my holiday manicure. Originally, I did it to enter the China Glaze Holiglaze Contest but when I went to submit my picture, I read in the fine print that I couldn't reference a copyrighted image so after crying hysterically I decided to use for the nail files! Also, my nails are a DISASTER after moving so there's no way I'm showing them to you until they've had some time to recover. Ha! If you've seen A Christmas Story, you'll get my incredibly awesome design (not that I'm biased, haha). If not, this clip will fill you in. Also, if you truly haven't seen A Christmas Story, you really should because it's all kinds of awesome. You can thank me later. Ha! What do you have planned for a holiday manicure? Only few days left to squeeze them in! Awesome! Never really seen that movie all the way through but you did a great job on this! These are awesome. My daughter has never seen that movie. We should watch it with her. Freakin brilliant!! I LOVE this! 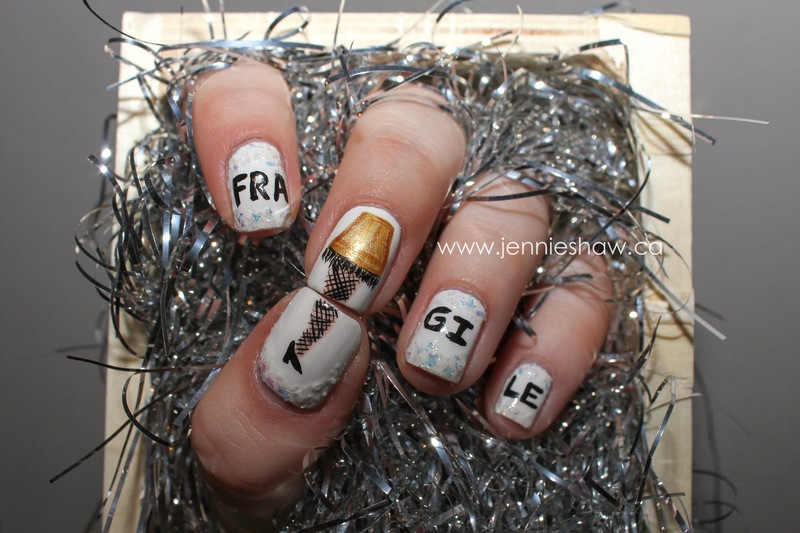 Ok, I'm loving your nails Jennie. You're just too creative with them. I love the designs too! Enjoy your evening!